I saw a rainbow, actually two. I jumped into the arms of a stranger as he hoisted me over a jagged waist-high wire fence. How was your day? It's January, and never let it said that Two Coots are afraid of a little cold. What's the saying, "There no such thing as bad weather, just inappropriate clothing." We have wool up to our eyebrows, and we've two tickets to Ireland. After shuffling on three legs of flight (ATL>JFK>London>Dublin), we emerge from the terminal in Dublin to cold air stinging our faces, actually a welcome jump start to our adventure. After all, it is January and Ireland's average temperature is 46 degrees; however, it's a very different 46 degrees than we're accustomed to experiencing. First, we pick up our rental car at Dooley's Rental. So easy that it was almost a sin, a lovely coot coupe as we will affectionately refer to it during our week. Len and I debated whether driving on the left side of the road would be an issue; surely not, we agreed. However, throw in shifting from the left - roundabouts - single lane roads edged with century's old rock walls, well, it became a whole different ballgame. Stay to the left. It's the slow lane, they instruct. We're living in the left lane for our week in Ireland. Repetition is the surest way to master anything. We'll cling to that thought. Just avoid the darkness we agreed upon, words we will eventually eat. Heading south from Dublin, our first stop, Powerscourt Gardens, named by National Geographic as the third most beautiful garden in the world. Even in winter, it was lovely and manicured to perfection. The ducks in the pond never let the cold dissuade them from zip-zagging around the pond statue. After the chilly walk around the grounds, we stopped into the cafe for tea, allowing our fingers the chance to find their feeling again. 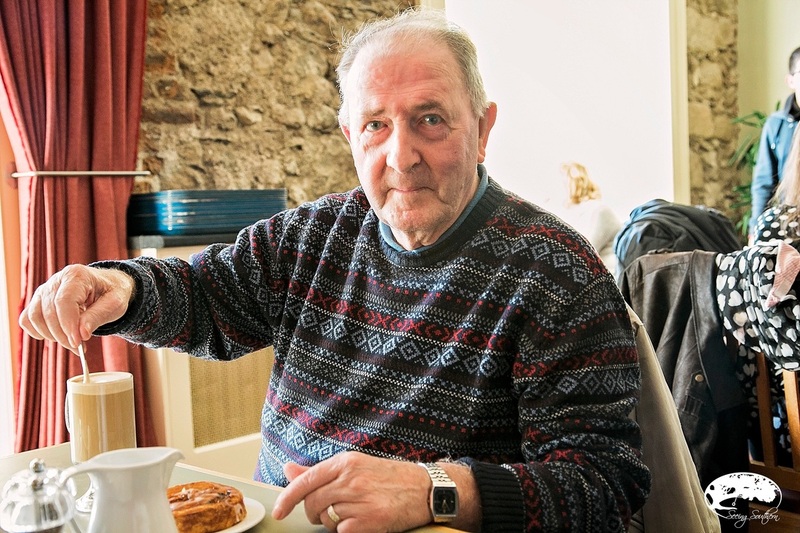 We enjoyed a pot of hot tea (plus scone and chocolate croissant) and enjoyed a conversation with a local older couple from Dublin. They told us they "come here everyday" to enjoy their cappuccinos and scones. "There's nothing like it," she offered. Then, surreal Glendalough. Founded by St. Kevin in the sixth century, we stood in the middle of a monastery where men walked thousands of years ago. We touched what they touched. Quite humbling when you think of it. Some structures still remain. Walk through the cemetery, see the chapel, and wonder about the secluded yet influential lives of these men. After Glendalough, we pass over the Wicklow Mountains, making our way southwest towards Kilkenny. As the elevation rises, the temperatures drop; suddenly, we’re in a snow cloud. 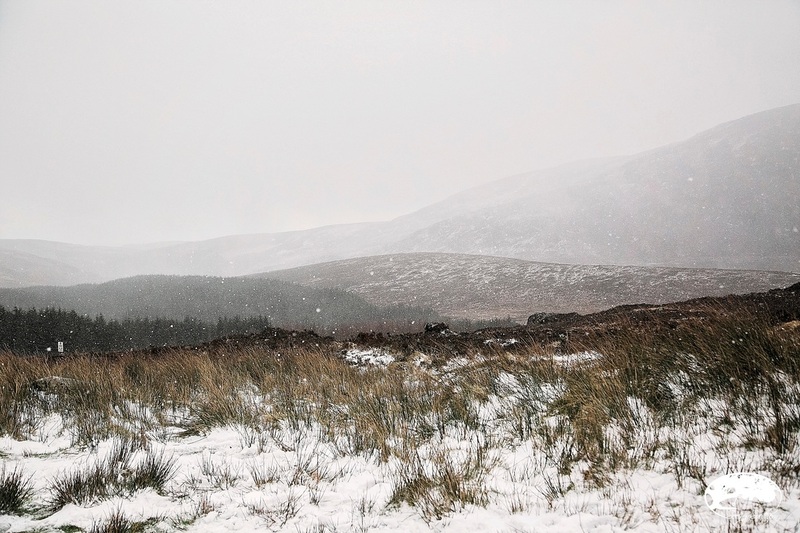 At the top – Wicklow Gap – our (at least Judy’s for sure) snow wish comes true. We hop out quickly, snap a shot, and scoot back inside and within a minute’s drive down the mountain, sunshine once more. We spend our first night in Kilkenny. At Butler's Court Guesthouse, Yvonne makes us feel right at home. I tell her I need shoes for my feet have been freezing all day, and I'm not sure I can make it a week. She rescues me with appropriate suggestions, and unfortunately for Len, it means shoe shopping. We visit the shop; in and out, we grab the last pair of snow shoes and make a dash for the pub of choice, Kytelers Inn and Pub (since 1324). 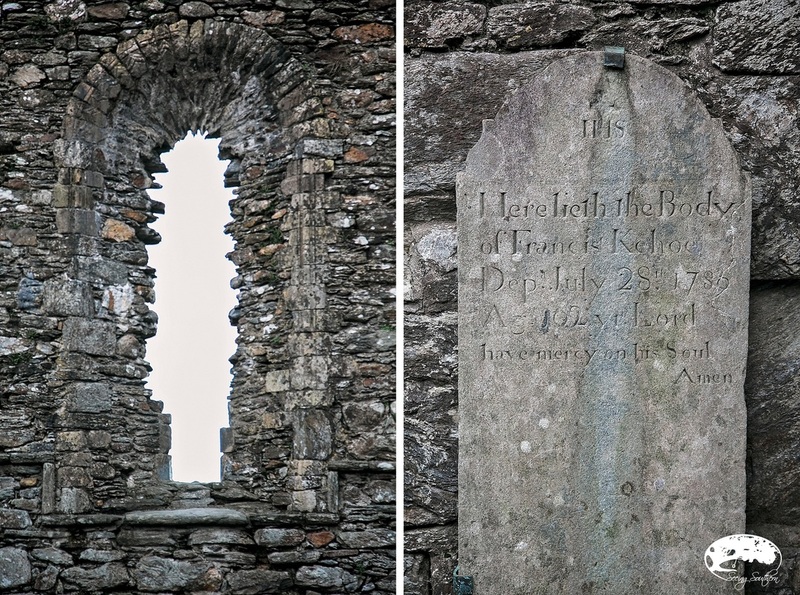 We walk through the unusually narrow doors (ones will we continue to find throughout the country) and feel as though we've walked into an Irish movie. Exactly the same. Dark wooden beams and bold furniture. Fire blazing. Men with pints of Guinness. Football on the TV. Conversation throughout. A young man seats us and and older gentlemen returns. We ask for the crowd favorites. Everything, the he boasted with an added promise of "I'll take care of you." He quickly told of his two favorites, Hot Chicken & Ham Vol-Au-Vent and Bookmakers Sandwich. "Done," I said. Pair each with a pint (that's the understood code for Guinness), and we feel like ourselves again. Back to Butler Court Guesthouse. It's time to dream, and then tomorrow, put these new snow shoes to work. 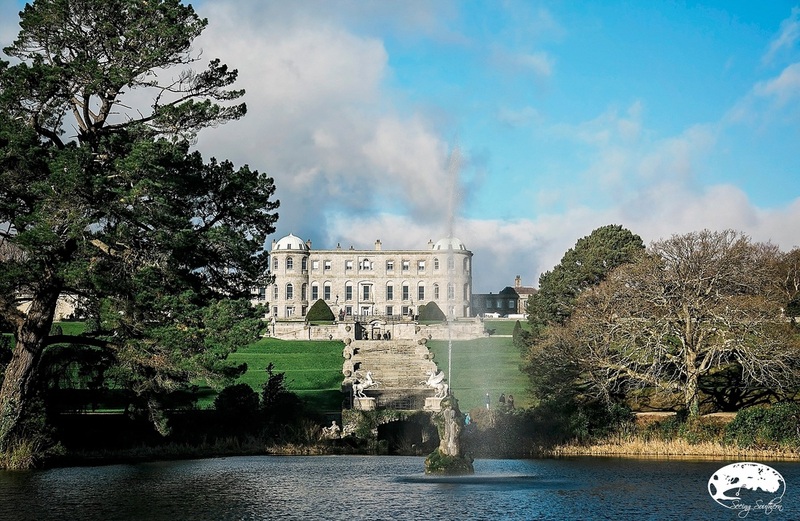 The house and gardens are located on 1,000 acres in Wicklow County. There are 47 acres of gardens (Italian, Japanese, a Rhododendron Walk, and more) and offers views of the surrounding countryside. It is home to the largest pet cemetery in Ireland. There's a golf club for the sports enthusiast, and for the ladies, just down the road, the Powerscourt Hotel Resort and Spa, a 5-star luxury hotel. The gardens are open year-round, with admission being 8.50 euros during peak season (March-October), and 6.50 euros during the winter months. Don't miss your afternoon tea at the Avoca Terrace Cafe. 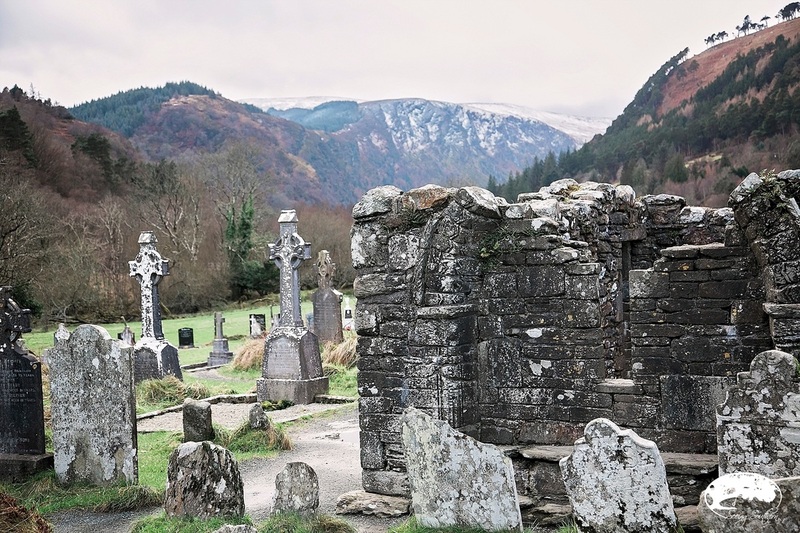 Glendalough is one of the most important monastic sites in Ireland. Founded in the 6th century by St. Kevin, most buildings that remain date from the 10-12 centuries. 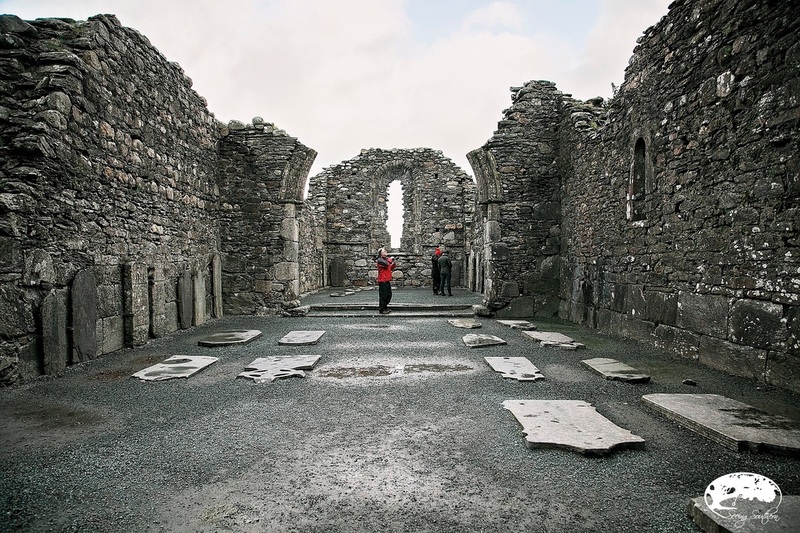 It was attached by the Vikings yet has thrived as one of Ireland's great "ecclesiastical foundations and schools of learning until the Normans destroyed the monastery in 1214 AD." Called St. Kevin's Kitchen (above left), people believed the bell tower was a chimney to a kitchen but no food was ever cooked here. Its most famous and recognizable landmark is the Round Tower which was built almost 1,000 years ago by the monks of St. Kevin's monastery. The towers were called "Cloigtheach" meaning bell tower which tells of their use. The tower was also an escape for monks when the monastery was under attack. It was also a beacon for approaching pilgrims. 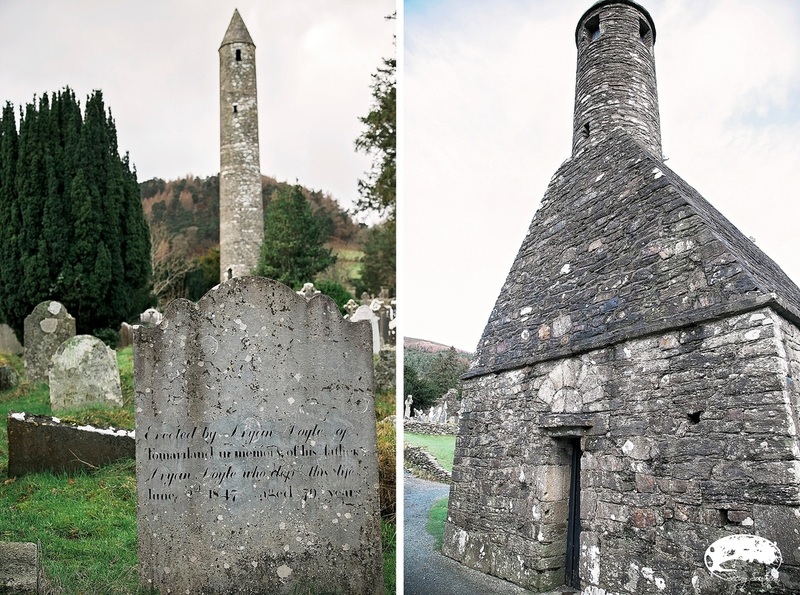 The Cathedral (below) is the largest of the seven churches in Glendalough. It was built in several phrases beginning in the 10th century through the early 13th century. The Wicklow Mountains form the largest continuous upland area in Ireland (County Wicklow). From Hollywood to Laragh (26 km), this is one of two routes which cross the mountains from east to west. In January, at the top!